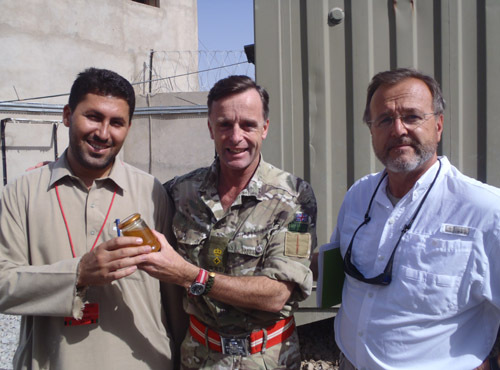 Lieutenant Colonel Tim Purbrick, the spokesman for Task Force Helmand, blogs about swimming in the Helmand River, saying goodbye to the troops as his tour of Helmand comes to an end, and his discovery of delicious Helmand honey. With less than two weeks to go of my six months as the Spokesman for British troops here in Helmand, there are a lot of loose ends to tie up: articles to write, Afghan and military friends to say goodbye to, places still to visit, meetings to attend, reports to write and the usual support required by the headquarters. My time is telescoping very quickly into a small space in which there remains a lot still to do. Paratroopers call it ground rush. Virginia Wheeler and Andy Bush from The Sun returned to Helmand to catch up with units that they had seen on their visit in May and to see other aspects of the work of the 49 strong Coalition of nations in Afghanistan. I took them down town Lashkar Gah with soldiers from 2nd Battalion Royal Gurkha Rifles who are the Police Mentoring and Advisory Group, helping the Afghan Police to grow their capacity and capability. We visited Precinct 2, one of the districts which has already transitioned from our responsibility for security to Afghan control, and then we went to splash in the Helmand River where kids were swimming and people were washing their cars. It was all boringly normal which, in my book, is a huge success. That night Andy and I walked over to Police HQ, about 200 metres from our base, to enjoy locally cooked kebabs with our Afghan Police comrades and the Gurkhas – spicy chicken with a delicious sauce, wrapped in a thick, nan-like bread which came in a folded sheet of newspaper. An important aspect of our troops’ return home is to try and gain some recognition for them for their service on operations in their local press. To that end I flew up to Main Operating Base Price, the headquarters of the Danish Battlegroup, which is also the base for A Squadron 9th/12th Royal Lancers and Brimstone One-Four, a four-man RAF, Army and Royal Marines Counter-Improvised Explosive Device team, to capture their stories before they head home over the next few weeks. 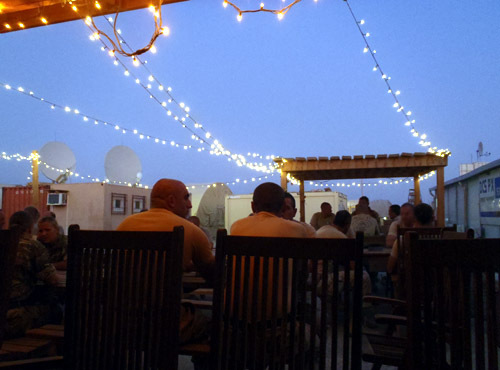 Camp Price is famous within Task Force Helmand because of the relaxed hospitality of our Danish Army comrades and the excellent quality of the food in their cookhouse but, perhaps, most of all because of the Kfum, pronounced ‘kuff’, which is a Danish charity coffee shop on the base. Here you can get coffee, tea, slushies, scrumptious cakes and delicious home-baked rye bread from 7.00 in the morning to 11.00 at night and you can choose – all do – to make a donation to the charity. The Vikings or Why-kings – Danes and the letter ‘V’ don’t mix – have a kfum on every base at home as it provides an important, informal place to meet, watch movies and, here, to chat through the tour and thoughts of home. I picked up a bag of bracelets made by the Women’s Centre in Geresk to sell at $10 each in Lashkar Gah. It’s a project set up by our Military Stabilisation Support Team at Camp Price and the bracelet project is being led by Sgt Karen Swallow RAF to raise money for the development of the Centre. They’re made of paracord with a Danish, three lion gold button to fasten them. Ten bucks might seem a lot but I think of it as a charitable donation to a good cause and I’ve got one on my wrist, two in my bag for two of my daughters and I’ve already sold $70 worth to others in Camp Bastion and in Lashkar Gah. My visit to Camp Price also coincided with two vigil services which are held at every one of our bases to celebrate the lives of each of our fallen comrades. At 6.30 in the evening the British led a service for Sgt Barry Weston of 42 Commando Royal Marines and later, at 10.00 that night, the Danes led a service for Cpl Jacob Olsen of the Danish Battlegroup. Both services were, as ever, highly moving tributes to the soldiers who had lost their lives and both were attended by hundreds of Danish, British and Bosnian troops – the Bosnians provide the Danish Guard Force – and supporting civilian staff. I flew back to Camp Bastion and caught up with Sky News’ Defence Correspondent Niall Paterson. Although I haven’t been escorting him he was putting his TV pieces together at the Joint Media Operations Centre in Bastion, working alongside Virginia Wheeler and Andy Bush who had just returned from a trip to Nowzad in northern Helmand. I have to check all imagery and words produced by the media and by ourselves to make sure that secrets about some of our people, the equipment we use, the way we use it and how we operate are not being given away to the benefit of our enemies here or elsewhere. It’s quite a strange feeling chatting through a ‘package’, as a TV report is called, with Niall and Richie and then seeing it a few short minutes later on Sky News. I also recorded an interview with BFBS, the Forces Radio and TV network, about the 10th Anniversary of 9/11. Most of our troops were 8-12 years old when 9/11 happened and, while it may not be at the forefront of their minds as they patrol in the Green Zone of Central Helmand, 9/11 has defined where we are today and why we remain in Afghanistan ensuring that this country can never again be used by international terrorists to launch attacks against us or anyone else – a secure and stable Afghanistan means a safer Britain. In my office Lashkar Gah I have a pile of articles to finish off for the Bournemouth Echo, one for Country Life on the secret walled garden here on the base (which they wanted thanks to the excellent photographs taken by Sgt Ali Baskerville – the MOG(V) Photographer in the Combat Camera Team) and all the articles and radio pieces on 9th/12th Lancers and the IED operators. There was a knock on the office door this morning. It was Don Welty, one of the Stabilisation Advisors from Geresk, with John, a local Project Manager. Now, I’m a bit of a honey addict. I have been giving pots of Dorset honey to friends in Helmand and when, at the beginning of my time here, I heard about Helmand honey, I have been on the case ever since. Don said that John, who manages the honey project, had a little gift for me and he produced a jar of Helmand honey. Bees not only produce honey but, even more importantly, their pollination work raises crop yields by up to 40%. As I write this, a jar of golden, musky scented, sweet Helmand honey is sitting on the desk in front of me. This entry was posted in TFH HQ and tagged Afghanistan, Army, British, Helmand, HERRICK, Kandahar. Bookmark the permalink. ← A lot of lives and limbs have been saved. A good week for Helmand. I am a great one for my help for heroes, RBL, Air Ambulance et cetera bands. Would it be possible and if so what would it cost me to have one of your bands shipped to me? Best of luck, Tim – hope to see you again soon. Thanks for this blog. I’m glad you managed to eventually get some honey. Did it have a poppy flavour?! This and all the other articles by service personal allow us a little insight into the lives of the brave men and women serving in Afghanistan and elsewhere. The British public obviously cannot be with you, but through these journals, they can in spirit. The television programmes made by squaddies carrying a mini-cam, allow us to vacariously experience the action… and the boredom, of life in the danger zone. It allows us to appreciate the work you do and express our gratitude properly when you return. Keep up the good work and come home safely. Great blog, Lt.Col Purbrick. Good to know that there are still some comforts for you all out there. We appreciate the work that you’re all doing to help the Afghan population, and by extension, helping our security. Sir, It is nice to see that Beekeeping can bring people together – we all have common interests and needs. I would love to hear more about the beekeeping, being a military beekeeper, and see some photos possibly. I am sure there would be the desire to have an article in a few beekeeping publications about this community builder that is bee keeping. Have a safe end to your tour. I’m nonetheless studying from you, however I’m improving myself. I certainly love studying every little thing that is written on your blog.Preserve the tales coming. I cherished it! Iraq, Afghanistan, has never, and couldn’t be a threat to the UK. This is simply over a love affair, Bush was shagging Blair. and we all pay for the flowers. Tell me about your experiences in Vietnam, Northern Ireland, I could about mine, only one was worth the effort.